Marvel Comics has begun a new miniseries that may just be one of the greatest ideas of all time: a series starring Lockjaw and other famous super animals from the Marvel universe. This includes Kitty Pryde’s Lockheed, Falcon’s Redwing, Speedball’s Niels (AKA “Hairball”), Aunt May’s Ms. Lion, and…a frog Thor? What? The book begins with Reed Richards consulting the Inhumans over an urgent matter regarding the Infinity Gems. Lockjaw happens to find one of these gems, unbeknownst to them, and is shoo’d away when he interrupts their conversation. This leads him to an encounter with a frog that dresses and talks like Thor, who calls himself Throg, and promptly goes into great detail to explain his origins. Throg then agrees to help Lockjaw find the other gems, but they first decide to recruit Lockheed, Redwing, Hairball, and even Ms. Lion, despite his lack of super powers. The ragtag, barely functional group then heads to the location of the second gem, but they find big trouble (literally!) along with it. I think the concept of this comic is amazing, and I almost want to give the writing the max score just for the idea of a frog Thor. Unfortunately, there is one minor flaw with the story. Even keeping in mind the fact that this is obviously meant to be a silly book, there’s a bit of a “Let’s suddenly work together for some reason” vibe about many of the character introductions. Nonetheless, I find the plot progression before and after the teaming up process to be well done, so it’s clear they did not want to spend the entire first issue gradually introducing everyone. I can’t completely fault them for that, especially when most of them are long existing characters. On that note, there is quite a bit of effort put into Throg’s origin, which is a goofy little story, and yet still seems quite logical. The dialogue and banter between the animals is also a lot of fun, with a bit of relatively subtle humor, as opposed to the constant gags one might expect from something like this. As for the art, it looks great, starting with an in-your-face cover depicting everyone but Ms. Lion in heroic poses that make me think, “epic, yet ridiculous,” which sums up the issue’s contents very well. The inner artwork is even better, with incredible detail put into the animals to make them look realistic — even Lockheed, if that makes any sense. That’s not to say that other things are drawn poorly, because they’re certainly not. However, Throg’s origin story is done by a completely different artist in a more offbeat, cartoonish style. The colors in those pages are also much more bland and flat than the varied and bright palette used in the main story. This alternate art is not necessarily bad, but it certainly feels inferior to the other pages. The very existence of an unconventional comic like this in modern comics makes me happy, and a few flaws aside, this book was quite enjoyable. It probably requires an open mind to truly enjoy it, however, as it is obviously of a less than serious nature. But, since most of my complaints were about character introductions, I expect the remaining issues to be even better, now that the introductions are out of the way. 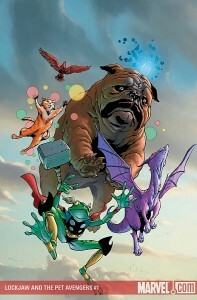 Lockjaw, Pet Avengers, and all related characters – © 2009 Marvel Comics. All Rights Reserved. This entry was posted in Comic Review, Reviews and tagged Aunt May, Avengers, Comics, Frog Thor, Lockjaw, Lockjaw and the Pet Avengers, Marvel, Marvel Comics, Review, Speedball, Thor, Throg on May 24, 2009 by Rachel Oliver.